In this tutorial, we will look on how to create a java project with Maven. In case you don’t have maven already installed on your system, Please follow Maven Download & Installation containing step-by-step instruction to setup maven. groupId : Refers to project packaging and identifies your project uniquely across all projects. artifactId : Name of jar of your project without version. version : Version number of your choice. archetypeArtifactId : Template type.Several templates are available to choose from. interactiveMode : If set to true, maven will ask confirmation on each step of project generation. File pom.xml contains the information and instructions for maven to do it’s job. You must update pom.xml with all the information your project will rely upon(dependencies, profiles,…). Please check Maven pom guide to learn more about pom. 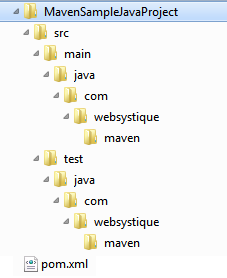 Step 3: Convert generated Maven project to Eclipse compatible form. You will see that maven downloads required resources/dependencies from maven repository.You will also note that maven have created a .class and .project file on project root.Thanks to these files, you can now import your project into Eclipse IDE. Open Eclipse. Select File->Import->Maven->Existing Maven Projects->Next , Browse to your newly created project directory, click Finish. From here on , you can use eclipse to manage your porject, edit pom.xml and enjoy other handy eclipse plugins like m2eclipse to quickly clean build or install your project. Note that here we are using TestNG framework to test our sample class.Now fire mvn clean install on command line/terminal. You notice that test case was successfully run and passed. Refresh your eclipse to find that project output(MavenSampleJavaProject-1.0-SNAPSHOT.jar) is generated and visible under target folder.This jar is also available on your local M2 repository.